One Big Yodel: Stop the Press! We sell Coca-Cola now! Stop the Press! We sell Coca-Cola now! Is anyone as amazed as I am that Migros (a large supermarket chain in Switzerland) is running an ad campaign to tell the world that they now sell things as unique as Coca-Cola? Wow. It's like it's news that people in Switzerland do drink things besides Rivella. Let's see. Coke has been around since 1886, so Migros is only, well, 124 years behind the times. Now that's a thing to advertise. Well, I don't. Never liked it. Sorry. Yeah, it's amazing. Switzerland will never be the same again. Actually, this is kind of a big deal - if you put it back in the context. It's only been a few years since Migros has sold other brands than its own (Mivella for Rivella, Eimalzin for Ovomaltine, etc.) . This is what made the main difference between Coop and Migros, even though it's not as obvious today. Now Migros has "brands" and Coop has its own product lines. BUT the only non-Migros brand that Migros has had for decade is... Pepsi. And I'm not entirely sure, but I think that Coop only had Coke at the time. So, I guess you can (doubly) compare the Migros-Coop sides with the Coke-Pespi opposition (which is kind of a big deal for many people too). Well, of course, this is not a matter of high importance, but from a (swiss) marketing point of view - and for people who've been here long enough to see the evolution - this is a pretty strong argument and I think it is worth advertising in the sense that it means something for people. 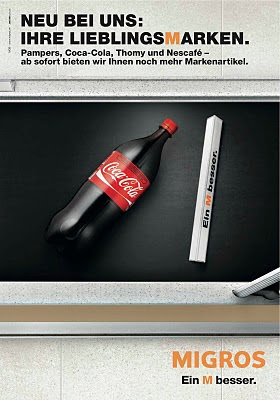 This aspects makes selling Coke a bigger symbol (of how Migros has changed even though they say they haven't). Haven't seen the ads but I will admit my friend and I exclaimed, "Oh! Migros is selling Coke now!" when we saw it in the store the other day. Anyhow, I'm sure you can imagine, to an American used to stores the sizes of football fields where you can buy every product on earth (including either Pepsi or Coke or R/C or every generic brand out there), it does seem funny for a store to advertise selling a product that's as worldwide as Coke. But I get why they are doing it. What made then change their mind beside making money? Making money! Yes, I understand where you come from. Funnily, I've felt pretty lost in the US, because I could buy 67 brands of sodas (who cares? ), but I had the hardest time finding good, fresh, unprocessed products and I felt that my choice was extremely limited. I probably told you how many shops I had to go through to find ground sage or good coffee. And again, I hit "publish" instead of "edit." I also wanted to remark that it's impressive how strongly we're all conditioned by how we grew up. I'm not used to have so many brands of sodas or toilet papers, but I don't see the point of having so many of them anyways. But put me in a Safeways, I will cry of despair in front of the chocolate, bread, and cheese displays and walk by 10 meters long chips and snacks displays without even looking at them. I agree that the quality of foodstuff available in Switzerland is superior to the France or Italy. However, focus on quality doesn't necessarily preclude giving the customer a choice - if that means Coke, Pepsi and all things in between, why not? I agree there are too many sodas, chips, and processed foods in the U.S. and that the quality of produce and breads is much better here! But like WEG, I would still like to have a few choices sometimes. But huge football field stores now make me dizzy too. Chantal, I hope it's okay, but I am writing a mini review of your Blog (which I love, by the way - so it is a good review, honest!) and that I shall be linking to you so you may get a small spike in traffic (very small...). Anyway, just giving you a heads-up. Love the blog, makes me laugh. I love reviews. Especially positive ones. Thanks in advance! so i'm guessing they missed taking part in that "teaching the world to sing in perfect harmony" thing, eh? Probably they were there singing and drinking the stuff. You just didn't notice because they were just there unofficially. Kind of like how they are with the EU. Take the benefits. Not the responsibilities. Dear Frau: Where are the Swiss soccer fans? What is wrong with Swiss hotels? Dear Frau: What should I pack? Dear Frau: I want to be a Swiss journalist!